1. This team lacks depth at the Major league level and the Minor league level for a solid #1 SP. 2. 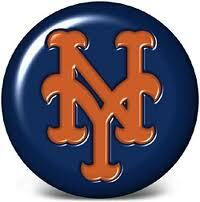 With Santana and Mejia both recovery from major surgeries, pitchers need to be the Mets #1 priority. 3. One of the Mets strengths at the minor league level is at the OF position (F-Mart/Nieuwenhuis/Vaughn/Den Dekker/Puello/Ratiff/Ceciliani/Flores-will most likely switch to the OF from SS. Another consideration and or concern that needs to be address is that the Mets need to also draft a player that will fit into their slot (revenue) and feel confident in signing. Also the Mets need immediate help, so drafting a college player would seem like the most logical choice. With that being said; here are my predictions for the Mets selections at #13 and #44. 1st round (#13): Taylor Jungmann (RHP) out of Texas or Jed Bradley (LHP) out of Georgia Tech. Whoever falls to them would be a solid pick and would compliment Matt Harvey in the Mets rotation in 2013. Supplemental Round (#44): Tyler Beede (RHP) out of Lawrence Academy HS or Chris Reed (LHP) out of Stanford. The Mets might shy away from Beede (higher ceiling) only because he made a verbal agreement to go to Vandy and choose Reed instead. From the 7th round on is anybody’s guess, possibly drafted talent over need. The Mets will also be active in signing talent from South America as well. In the past, they have been very successful in acquiring such talent as Mejia, Reyes, Flores, F-Mart, just to name a few. The endless challenge to shed cap-space continues for New York Knicks President of Basketball Operations Donnie Walsh. While Center Ronny Turiaf is expected to pick up his player option and return next season, Walsh is putting out feelers for Renaldo Balkman, even willing to throw in a considerable amount of cash to any team willing to take the two years left on Balkman’s contract. The Knicks have nine players under contract for next season, three of which are pending on team options being picked up. Ronny Turiaf is expected to pick up the player option on his $4.36 million contract and then spend the summer playing for the French national team. …The Knicks hold team options on Landry Fields ($788,872) and Andy Rautins ($788,872) that will both almost certainly be picked up. …If there is a team out there that likes Renaldo Balkman, the Knicks would probably be willing to trade him along with $3 million cash in exchange for nothing (which in NBA nomenculture is often called a conditional second-round draft pick). It just doesn’t end for the Knicks. It seems like this team always has bad contracts and salaries to shed. I have to give Donnie Walsh credit though, he’s done a great job. Getting rid of Balkman could be key, as every last million could help the Knicks put together a winning roster for next season. As for Turiaf, I’m glad to see him back despite probably not being worth $4 million. He’s a real defensive leader on this team. Ronny is definitely not a starting center, but he is one hell of a role player. If you pair him with a guy like Dalembert, the Knicks will have solid depth in the frontcourt. Staten Island's own is clearly one of the greatest Knicks to ever put on a uniform. It's only a matter of time before he gets his number retired along with Marbury and Curry. Rich Cimini of ESPN New York reported today on Woody Johnson’s opinion of Randy Moss. The Randy Moss-Jets speculation remains alive, and there’s a reason for that: It’s because the Jets have interest in the star-turned-journeyman wide receiver, as I wrote last Sunday. Owner Woody Johnson, for one, apparently believes Moss, coming off his worst season, still has the potential to play like a star. Know this about Johnson: He loves chasing players with marquee appeal. Some might argue that Moss is washed up, but he’s still a big name and we’ve seen over and over how the Jets like to add big names. So if Braylon Edwards signs elsewhere as an unrestricted free agent, which I suspect he will, the Jets will be in the Moss hunt. As I’ve said before, Moss on a cheap, one-year deal isn’t a bad move at all. I’d much rather have Braylon and Santonio back, but Moss isn’t a bad consolation prize. I have no doubts that Rex Ryan could get the best out of him. Normally I wouldn’t be rooting for a team from Canada in the Stanley Cup, especially since they acted like sore losers in 1994, but we must unite as New Yorkers against the Bruins. I wasn’t expecting the Bruins to make the Finals, as I have even repeatedly called them frauds. Boston simply can’t win another title. They don’t deserve it. Not only am I rooting for Vancouver, I think they will easily win this series. This is one of the best teams I’ve seen in my lifetime as a hockey fan. They should wipe the floor with Boston. I’d also like to add that Jim Dolan should be embarrassed and furious at one playoff game win in eight chances with the Knicks and Rangers this season. Unfortunately, I highly doubt he cares. Two historic rivals of New York, the Heat and Bruins, are now closer than ever to winning titles. When will Knicks and Rangers fans get a chance to see their team win even a playoff series? Nets to Trade Up for Derrick Williams? The Bleacher Report claims that the Timberwolves could trade the second overall pick to the Nets. Minnesota will most likely trade the pick away and a likely suitor is the New Jersey Nets. The Nets don’t have a first round pick in this year’s draft after they traded it away for Deron Williams. New Jersey desperately needs a small and power forward. They can instantly start Williams in whichever spot they prefer. He averaged 19.5 points and 8.5 rebounds a game last year at Arizona. Many consider his three point shot a weakness, but he shot 57 percent from behind the arc for the season. At 6’8″, 240 pounds, you can call him a tweener, or you can call him a match-up problem. He’s going to be too big for wings to guard in the post and too quick for bigs to guard on the perimeter. Minnesota could ask for a package of a future first round pick plus one or two players like Jordan Farmar and Damien James in return. First of all, the article is wrong. The Nets do have a first round pick this year. They could trade that, their second round, along with future picks and some players to move up. I’d really support this move. All signs show Williams could become a great player in this league. He could be the long-term fit at SF. If the Nets re-sign Humphries, then SG is the only position of concern. This is the move we could look back on as the one that changed the Nets franchise forever. I’m 100% on board with this, although the chance of it happening is slim. Could we see a Deron Williams to Derrick Williams connection in Newark next season? After the screwjob that was the 2006 NBA Finals, the Heat and the Mavericks are at it again. Of course, everyone wants to see the Heat lose. We are no exception. This blog was started mainly because we wanted to organize and record all of the events that would go down during the Summer of 2010. We really thought he’d sign with the Knicks. However, he took his talents to South Beach instead. Championship or not, we still believe Lebron made the wrong choice. One title in Miami isn’t nearly the same as one in Cleveland or New York. Miami doesn’t care about basketball at all. Not to mention they just won in 2006. Brett Yormark said the Nets will announce the team’s new name in the next few weeks and, if the CEO had his preference, it will be the Brooklyn Nets. 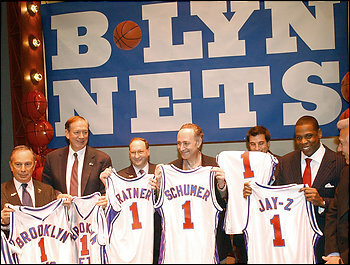 Despite signs that the Brooklyn Nets will be the name, Yormark said it’s still just a running title. But I’ll guess that’s because it hasn’t gone through the league’s approval process. I think “Brooklyn Nets” is the way to go. “New York Nets” has some positives and negatives. The main positive is that it would tweak the Knicks. The main negative is that you’ll always be compared to them. The Brooklyn identity allows you to form your own history and tradition without being compared to the Knicks. It also helps you gain a fanbase in Brooklyn, as inserting the borough in your name will certainly make many Brooklynites happy. Hey, “Brooklyn Knights” isn’t such a bad name. Get it?